The First World War (WWI) was a major war centered in Europe that began on 28 July 1914 and lasted until 11 November 1918. Known as the World War or Great War, it was supposed to be the war to end all wars. All the world's great powers were involved in World World One, which were assembled in two opposing alliances: the Allies (centered around the Triple Entente) and the Central Powers (originally centered around the Triple Alliance). There were many long term causes of the war including some of the conflicts and hostility of the four decades leading up to the war. Militarism, alliances, imperialism, and nationalism also played a major role in the conflict. However the immediate trigger of the war, was the assassination of Archduke Franz Ferdinand of Austria, and his wife. They were in Sarajevo, Bosnia which was part of Austria-Hungary when an irredentist Serb Gavrilo Princip committed the act. It was in protest of Austria-Hungary having control of this region as Serbia wanted to take over Bosnia and Herzegovina. The assassination led to Austria-Hungary declaring war on Serbia. The alliances formed over the previous decades were invoked, and within weeks, the major powers were at war via their colonies, and the conflict soon spread around the world. 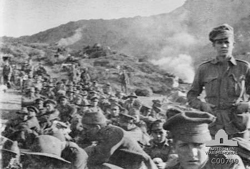 For Australia and many other nations, the First World War remains the most costly conflict in terms of deaths and casualties. From a population of fewer than five million, 416,809 men enlisted, of which over 60,000 were killed and 156,000 wounded, gassed, or taken prisoner. More than 70 million military personnel, including 60 million Europeans, were mobilised in one of the largest wars in history and more than 9 million combatants were killed. It was the sixth deadliest conflict in world history, which paved the way for various political changes, such as revolutions in many of the nations involved. On 28 July, the conflict opened with the Austro-Hungarian invasion of Serbia followed by the German invasion of Belgium, Luxembourg and France; and a Russian attack against Germany. After the German march on Paris was brought to a halt, the Western Front settled into a static battle of attrition with a trench line that changed little until 1917. In the East, the Russian army successfully fought against the Austro-Hungarian forces, but was forced back from East Prussia and Poland by the German army. Additional fronts opened after the Ottoman Empire joined the war in 1914, Italy and Bulgaria in 1915 and Romania in 1916. The Russian Empire collapsed in March 1917, and Russia left the war after the October Revolution later that year. After a 1918 German offensive along the western front, the Allies drove back the German armies in a series of successful offensives and United States forces began entering the trenches. Germany had its own trouble with revolutionaries at this point, and agreed to a cease-fire on 11 November 1918, later known as Armistice Day, Remembrance Day or Poppy Day. The war had ended in victory for the Allies. By the end of the war, four major imperial powers, the German, Russian, Austro-Hungarian and Ottoman empires, ceased to exist. The successor states of the former two lost a great amount of territory, while the latter two were dismantled entirely. The map of central Europe was redrawn into several smaller states. The League of Nations was formed in the hope of preventing another conflict. The European nationalism created by the war and the breakup of empires, the repercussions of Germany's defeat and problems with the Treaty of Versailles are all agreed to be factors contributing to World War II, which was a larger and deadlier global war that started in 1939. The effect of the war was also felt at home. Families and communities grieved the loss of so many men, and women suffered the physical and financial burden of caring for families. Anti-German feeling emerged with the outbreak of the war, and many Germans living in Australia were sent to internment camps. When the war ended, thousands of ex-servicemen, many disabled with physical or emotional wounds, had to be re-integrated into a society keen to consign the war to the past and resume normal life. 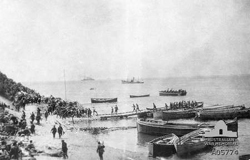 The photo on the right shows reinforcements coming ashore at Anzac Cove, Gallipoli Peninsula, Turkey 1915-1908.